When you first pull up to this joint, you think there's no way all of the hungry customers lined up will be seated in the present decade. There's a stove next to the sidewalk with a vat full of boiling broth and bobbing bits. Two tiny rooms with short counters where people sit elbow to elbow slurping from bowls. But the queue moves with surprising speed and you wonder where they are putting all of these people. When we reached the front of the line we were told to follow the folks in front of us halfway up the block to a slightly larger room behind a steamy sliding glass door. We were seated at a table with another couple and handed menus. The woman at the front of the house notified the crew managing the line outside via walkie-talkie each time a table was vacated. 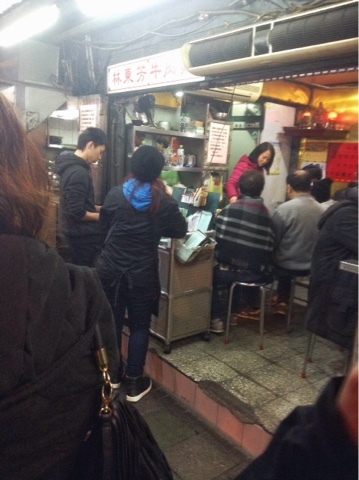 We ordered a small appetizer of the recommended house tofu and bowls of the signature soup. The soup itself was amazing. It consists of large gauge, chewy wheat noodles and meltingly tender slices of beef shank in a rich, dark beef broth flavored with five spice. A pinch of scallions is scattered on top. The shank is so tender, the webwork of sinew shot through the slices has taken on an unctuous, almost creamy texture. Each table is outfitted with a jar of thick, sweet chili paste in case you want to zap up your bowl, but the flavor of the broth is already so deep as to render condiments superfluous. I almost cleared a large bowl of the stuff and, in so doing, put the hurt on myself. It was the most burstingly full I ever was in Taiwan. Oops, too hungry to take a photo at the outset. 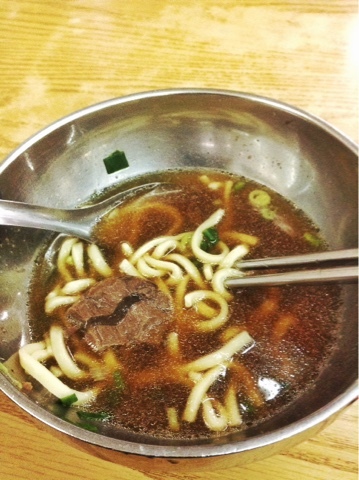 Though considered by some to be a national dish of Taiwan, our Taipei cooking teacher (more on her later) told us that beef noodle soup is not a traditional Taiwanese dish. It's hard to say what is and what is not traditional in a hodgepodge culture like Taiwan, but I suppose she meant that the soup style was brought to the island by mainland Chinese during the Chinese Civil War. Regardless, the island's inhabitants have made it their own and it is a thing of beauty.